A reflection for the 32th Sunday, Ordinary Time, B. The readings are 1 Kings 17:10-16; Psalm 146; Hebrews 9:24-28 and Mark 12:28-44. I don’t know about this widow in today’s Gospel. I don’t think she’s very responsible and I don’t think that she’s really making much of a sacrifice that’s an example for me. See, if she really has nothing and has begged for these coins – which we understand to be worth a few cents – then, shouldn’t she be going to get a coffee and a donut or something? Especially if she is – like I’ve seen her depicted in many works of art – a young widow and a mother of a young child. If she had two bucks that someone gave her to buy food or milk for her baby, she shouldn’t put in the Temple offering. She should go buy milk. If she had $10, maybe she can put $5 in the basket and then go get some milk and food for her or her baby. But apparently she didn’t have $10, but a few cents… which leads me to conclude that she is actually not an example for me. If you have nothing, it’s not much of a sacrifice to give it all away. It makes no difference to her whether she has 50 cents or nothing. If you have $100,000 and you have to give it all away, that’s a sacrifice. When you have nothing much, it’s not a sacrifice to give it all away. Which is why I am not going to talk about her. Let’s look at the other widow instead: The one from the Book of Kings. Now, she is a bit more responsible. She has a little bit of flour and some oil left and she is going to use it to make a cake to feed herself and her son. And even though she says that then they’ll die (a bit dramatic), tomorrow, she was probably going to figure something out. But then this old man shows up – a Jew nonetheless! And asks her to give him the only food she has left. If you notice, she doesn’t agree to bake him the cake until he promises her – prophecies to her – that God will take care of them and she will not run out until the drought it over. She’s willing to give all she has away to a complete stranger because she trusts God. And she trusts enough to give everything away first, knowing that God will take care of her. That’s what this is all about. Do you trust God with everything in your life? Cause that’s how it often is: We ask God for stuff, for help, for assistance, for healing – for good things – things that we need; and God doesn’t answer, or we don’t get the answer that we want. Maybe it’s because God is asking you to give yourself TOTALLY to Him; give everything to him. Show him that you trust no matter what, without expecting anything in return. See, we are not like that widow. We say that we trust that God will take care of us, but just in case, we keep a bit of flour and oil… just in case – ‘cause that’s the responsible and prudent thing to do. And that helps me understand the widow in the Gospel a bit better. I think Jesus speaks of her, not to show that she gives everything she has because she is such a generous giver, but to show how she gives everything she has because she trusts that God will take care of her. She doesn’t want to. She’s not sure if she actually heard God say that. She is confused. How about she buys her coffee and donut and then the next $2 she gets, she’ll take that to the Temple. But still, she goes to the Temple (reluctantly?) and drops in the money. She trusts… and then for the rest of the day no one gives her anything. She thanks God and continues to trust. Then, at night, as she is finding a place where she and her son can spend the night, she finds a 10 dollar bill! Isn’t that the sacrifice God asked of Abraham? He promised him a son and then when he finally has a son, God asks him to sacrifice him… why? To show God his complete trust. That’s how God works. 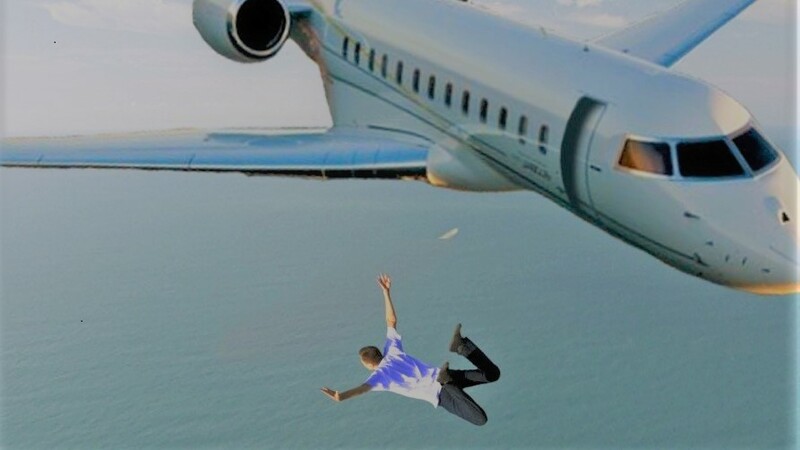 He asks you to jump off the plane. He promises that He will give you a parachute and so you wait and wait for the parachute that never comes – so you never jump and you are miserable because God doesn’t answer your prayers, when all along God wants you to jump off the plane FIRST and THEN He will give you the parachute! How many of us trust God that much? And I think Jesus looks at the widow and is thinking about the sacrifice that He is being asked to make. That’s what the Letter to the Hebrews tells us. Jesus makes the ultimate sacrifice; He gives Himself to God in total trust and obedience. Can we do the same? It’s maybe fitting that today is November 11 and we remember all those men and women who went to war knowing that they might not come back. They went willing to make that ultimate sacrifice. 10 million of them died in World War I. God is probably not going to ask us to literally give our lives and die – He might – but that’s not likely. But He does want you to give your life – EVERYTHING about your life – to Him, completely, in complete trust. Our Churches are full of good and caring, loving, faithful and prayerful Christians who do their best to follow Christ, but who have not given themselves totally to Christ. Who have not surrendered everything to Him; who have not jumped off the plane trusting, knowing that God will give them the parachute before they hit the ground. Today is a good day to start by asking Him to take you completely and to help you give everything to Him. Next time you receive Him in the Eucharist – He who gave himself and continues to give Himself completely to you – so you can eat Him and He can become a part of you – ask Him to take you completely. That was the young man who asked what he had to do in order to get to Heaven: “go and sell everything you own and then come and follow me” (Matthew 19:21). And he went away sad because he had a lot of stuff. Last week we asked what is the greatest commandment: “you shall love the Lord, with all your heart, all your mind, all your soul and all your strength…” (Mark 12:29-31). That’s complete giving. Give Him all your heart, all your mind, all your soul and all your strength…. Give Him your dreams, your fears, your past, your hopes, your anxieties, your finances, your employment, your family, your health, your marriage, your fertility, your children, your leisure time, what you read, what you watch on TV, what you listen to on the radio, your education, what you eat… everything. Give him everything. Hand everything over to Him. Because He gave everything for you. And then, do it again the next day; and again, every day. Because even if you are not aware. He gives Himself to you over and over again every day too.